Ghohar nab sara is seller, supplier and exporter of Iranian Almond. Sale prices are direct from the farmer. This dried fruit contains vitamin B and E. Also contains Manganese, Potassium, Folic Acid and Calcium. It is the only fruit that results in Blood Cholesterol reduction despite the fact that it has a significant fat. Almond is sold in Iran in two different types: Core and Paper Skin. The most famous is in Iran, are produced in Fars, Azerabadegan and Kerman. Tree, has long and narrow leafs and its blossoms appear after the leafs would grow. That Fruit has thin and green shell in early days that is covered by fluff and is called "chaqaleh" and gets hard and rigid after a period of the time. 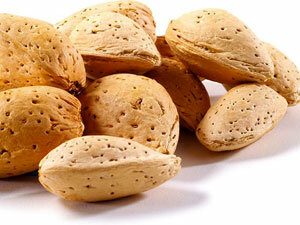 Sweet Almond is used either raw or roasted and also it can be used in oil extraction process of fruits. This kind of oil is getting widely used in medical and soapmaking industries. Almond is called "luz" in arab countries and early almonds that is called "chawaleh" is stomach and gums booster. This dried fruit is sold in two different ways in Iran: Almond kernels, Almond in shell.